(Jacqueline Larma | The Associated Press file photo) In this Feb. 27, 2017, photo, Rabbi Joshua Bolton of the University of Pennsylvania's Hillel center surveys damaged headstones at Mount Carmel Cemetery in Philadelphia. The shooting rampage that killed more than 10 people at Pittsburgh's Tree of Life Synagogue on Saturday, Oct. 27, 2018, is being decried as the deadliest attack on Jews in U.S. history. Yet the carnage, however unprecedented, is not an aberration: Year after year, decade after decade, anti-Semitism proves to be among the most entrenched and pervasive forms of hatred and bigotry in the United States. New York • Swastikas scrawled into Jewish students' notebooks. 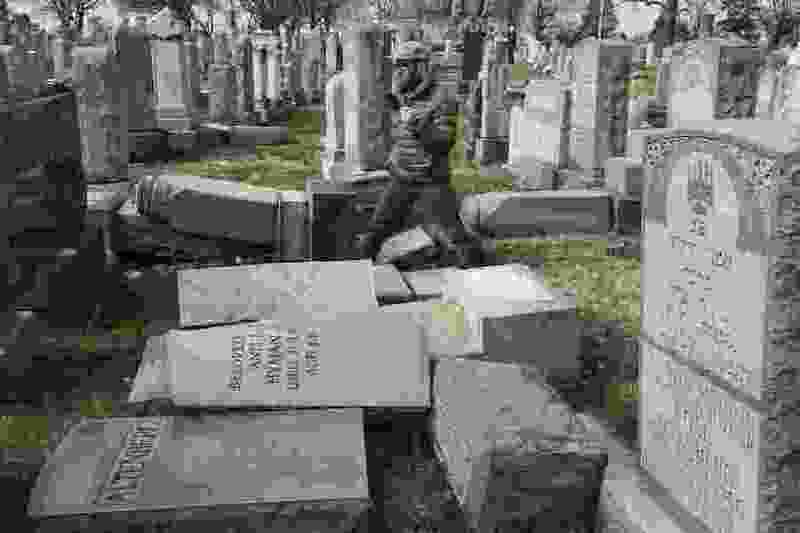 Headstones toppled and desecrated by vandals at Jewish cemeteries. Jews falsely blamed for challenges facing the nation. ADL researchers analyzed more than 7.5 million Twitter messages from Aug. 31 to Sept. 17 and found nearly 30 percent of the accounts repeatedly tweeting derogatory terms about Jews appeared to be automated bots. But accounts controlled by real-life humans often mount the most “worrisome and harmful” anti-Semitic attacks, sometimes orchestrated by leaders of neo-Nazi or white nationalist groups, the researchers said.